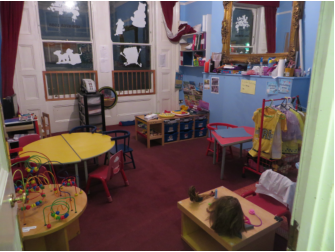 The toddler's room is affectionately known as the Parrot Room and has been specifically designed to be welcoming and inviting whilst seeking to promote independent learning, social skills and personal development essential for all toddlers. The room is stocked with activities designed to stimulate and invite exploration and experimentation thereby enabling our toddlers to grow in the area of independence and decision making abilities. This coupled with our friendly, caring, enthusiastic and highly qualified and experienced staff and team makes for a winning combination and a stimulating and safe environment for your child. Our staff works closely together and with the support of our toddler’s parents' to care for their child's individual needs. Our toddlers are encouraged to be creative in painting, drawing and engaging in a wide range of activities. We also take into account, the physical developmental needs of a toddler through using the indoor and outdoor free flowing space and environment and of course in quieter moments there is time to look at books or complete jigsaws. Our staff will also ensure that our toddlers can have the opportunity to rest, sleeping on very comfortable and clean sleep mats or in cots. Up to the age of two the ratio of staff to children is 1 to 3 after which it rises to 1 to 4. We are of the firm belief that toddlers develop and learn best in an environment that is full of opportunities for them to explore and be imaginative, create and follow their own particular interests. Their day is structured but flexible to meet the individual needs of toddlers. Indoor and outdoor experiences are also planned offering a wide variety of opportunities.